Q: How about underground construction? As in a storm or fallout shelter. I am looking for a construction method that can be done individually over time without having to hire any big earth moving equipment or hired help. A: Earthbags certainly fit this bill, since they can be used below grade and they are easy for one person to handle. You will need to carefully engineer whatever you design so that it will withstand any weight that is placed upon it. Q: How about waterproofing considerations? A: Yes, it would have to be waterproofed, and could be done with a few layers of heavy polyethylene plastic. Q: Has anyone done this already? A: I buried my earthbag pantry dome, which was covered with plastic and backfilled with maybe 6 inches of soil and gravel. Q: This is a sincere request for your input on using earthbag techniques to build an underground shelter. A: I feel that earthbags are an excellent choice for building shelters that are earth-bermed or even earth-sheltered...but these must be carefully designed and engineered to withstand the incumbent pressures. One major advantage of earthbags is that they are generally not adversely affected by moisture, unlike many other building materials. And, of course, earthbags are a good choice because they are environmentally benign, representing very little embodied energy. In general I would suggest considering designs that have curved walls, as these tend to be stronger and can withstands the pressures of earth better. As for a roof on an earth-sheltered home or a totally underground structure, this would be a most important element. Domes are a possibility, but burying earthbag domes is largely untested, so there might be some risk here. Q: Have earthbags been used for shoring an underground tunnel or shelter? A: Earthbag vaults are a bit tricky, but possible if they don't span any more than about 6 feet max. Q: Or to ask the question another way, if you wanted 2 or 3 feet of earth surrounding you on all sides and overhead, how would you go about building it? A: I actually would consider burying a prefabricated steel quonset structure, which could be insulated on the outside with bags of crushed volcanic rock, then covered with plastic before backfilled. This sort of thing has been done successfully, as long as the backfilling is done carefully, and evenly from side to side, so that there is not too much stress from any one direction. Q: I've decided to build with earthbags on our nearly 3 acre lot in Chattanooga, TN. I want to do a series of domes and kivas. 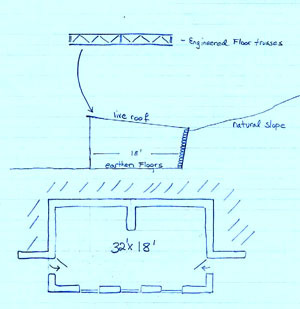 Do you think that I could get away with a 25' kiva that is two story with a bond beam between levels and is bermed into a south facing slope up to ten feet? I know that the round earthbag walls give it better structural integrity, but do you think it is enough to push that much dirt up against it? A: A circular, vertical-wall earthbag structure of 25' diameter should be very strong indeed; I would say it could easily withstand the pressure of a 10' berm. You would want the bags to be well compacted into place and the use of barbed wire to help maintain integrity...to make it as solid a wall as possible. Also, obviously you would want a moisture barrier between the earthbags and the berm, and possibly some further drainage provided, depending on soil, climate, water table, etc. Q: I'm an architecture student, and the more I learn about conventional building methods, the less sense they make to me. I'm looking at building my house and I have a question. Can an earthbag dome 25' diameter and 20' high, supported by an internal framework of whole logs every 4' OC, be covered by 2' or more of dirt? What would be the load bearing capacity of such a structure? A: I wish that I could give you a definitive answer to your question, but unfortunately there are too many variables to do this. Also, I am not a qualified engineer, so it would not be a good idea for me to offer such critical advice. From my experience it is difficult to keep soil up on an earthbag dome because it naturally wants to slide off, so this is another factor. Q: Is there anyone combining an underground house with earthbags AND passive solar. A: I haven't heard of any actual underground earthbag homes, although I do advocate this if the engineering is done carefully. 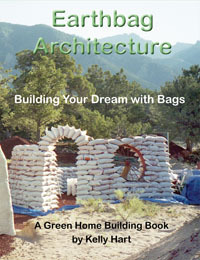 The earthbag house I built in Colorado was substantially bermed on the north side, and the pantry was completely covered with earth and stone. Q: Is it possible to build a subterranean structure buried in earth with earthbags? The idea is to dig a great big hole, build a series of interconnecting earth bag domes as a storage facility and then to bury it, leaving only the entrance and exit leading to the ground level. A: I think that this may be possible, but the concept has not been fully explored. Some experimentation is called for. Q: I and am currently building a shelter that will be primarily underground. It will be 7 foot high to the bottom of the joists and the floor is appx 6 feet underground. My question is this, I am using standard sandbags, 14" by 26" as I had a supply of these available, the design is a 14 ft inside diameter circle. I will be using a center pole to support a framework of double 2x6 to create and support a living roof. It is my intention to lock these joists in between the top course of sandbags and attach them to the wall. Does this sound like it will be strong enough considering how much of the structure will be underground? My thought is that any lean I might have due to the thinner wall will be negated by the fact that the joists will provide integrity to the top of the wall. I am currently on the fifth course of bags. Any concerns you might have or considerations I should look at? I live in the Florida Panhandle and the ground composition is called Lakeland Sand, primarily sand with some clay content. A: I would expect that a cylinder of earthbags like you suggest would be quite strong enough to withstand the pressures of berming, especially if you compact the soil well so that it locks into solid rings that resist any lateral forces. A sandy soil with some clay is usually ideal for earthbag work. If you moisten is slightly before compacting, and then let it dry thoroughly before backfilling it will be even stronger. I presume you will be placing a plastic moisture barrier over the exterior of the bags before berming...and include a French drain at the base to avoid water working its way inside. 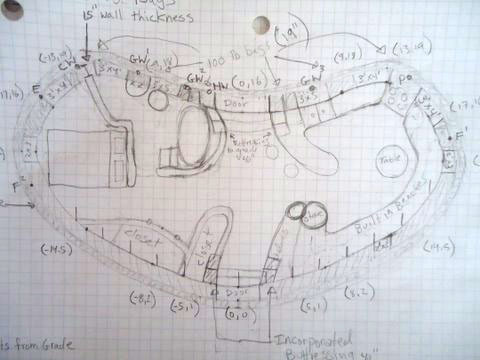 Q: We are going to be building a 16' underground hobbit house. The basic design of the hobbit house follows principals in the Mike Ohler $50 and up Underground house book; the problem I see is that dirt is packed against the side walls and we want the interior dry. The hobbit house will have an earth roof and unless you knew it was there will be invisible to my neighbors. What you would do to protect the underground earthbag wall? A: To keep your Hobbit House dry I suggest placing a curtain of two layers of 6-mil polyethylene plastic over the outside of the bags before backfilling. Again, a carefully designed French drain at the base of this should be installed, and the drainage at grade kept away from the house. I did this on my bermed earthbag house in Colorado, and never had a drop of moisture come in. Q: I am interested in building an underground earthbag home as a home for me and my family, I intend on digging the hole and then building the earthbag dome in it. Would domes attached to the sides (as in main center dome is main house with a possible pantry or bedroom on the side) built in dome form effect the structural strength of a dome shape. Are there any sorts of engineering tables for earthbags? I understand this could be hard as the bags contents vary from place to place. A: I wish that I could tell you that what you describe is entirely possible and safe to do, but unfortunately very little experimentation has been done with burying earthbag domes. I believe that it is possible, given careful design and backfilling procedures, but I know of no actual examples. I have been communicating with someone who plans to do this very thing for a large project in Mexico, but he is still in the planning stages of this. So, if you want to try this, it could be extremely valuable for furthering the knowledge of earthbag building...but the outcome cannot be assured. Q: I've just gone through your website and I like the idea of an earthbag home. However I would like to build a home that is mostly underground, probably with a living roof (I kind of like hobbit houses...). Can this be done with an earthbag home? Do you have to do anything to support the walls so the backfilled earth doesn't gradually force them in? Do you have any plans for such a home. The county we are moving to said they are willing to let us build an unconventional home IF we have plans certified by an architect. I appreciate any help you can give me with this! A: With proper design you can go underground with an earthbag home. It is generally better if the walls are curved against the berm so that any pressure against them will tend to compress the bag wall rather than expand it. There are several plans for earthsheltered designs at http://dreamgreenhomes.com/styles/earthsheltered/livingroofs.htm and earth bermed plans at http://dreamgreenhomes.com/styles/earthsheltered/earthbermed.htm It may be necessary to have the plans certified by a local architect or engineer, depending on the requirements of your local jurisdiction. Q: I have read that being round is strong, so I am assuming the (vertical) walls should be ok after berming? A: I agree that a round earthbag structure of this sort can withstand the pressures of berming. Do the inside and outside surfaces need to be plastered (using multiple layers of plastic outside for waterproofing) or could I have the walls sprayed with foam insulation 3-4 inches thick plastic draped and then bermed? Yes, I would advise using layers of plastic as a moisture barrier below grade, or in bermed situations, but a plaster is not necessary. The walls could be spray foamed, but this may not be necessary either, since the structure is intended to be a root cellar/storm cellar, and doesn't need the insulation...in fact a true root cellar does better if it is earth-coupled. Would bags filled with rice hulls be ok to use for a bermed structure? Q: I am looking for an economical way to build an underground woodworking workshop in my backyard. The earthbag technique is very attractive to me because of cost. Originally I wanted a 12' by 30' structure with vaulted roof but I understand that the dome shape is easier and more stable. I am looking for a way to do this without spending more than about $1000. If the walls are about 7 to 8' tall (with slight inward curve) before making the dome top (no more than 60 degrees from horizontal), and the structure is buried on all sides up to the 7' or 8' walls with about one foot of dirt on top, what kind of reinforcement would I need? A: Unfortunately, there aren't very many examples of buried earthbag structures to learn from, but one that I know of is shown at http://earthbagbuilding.com/projects/mendome.htm. I'm not sure exactly how much soil was placed on this, but I suspect it was less that one foot. It is not easy to get soil to stay put on a 60 degree slope, and this dome used fishnet and sod to help hold the soil. This little dome is smaller than what you are proposing, so with a larger structure, the dynamics of support for the roof might be different. One approach you might consider is what I did for a bermed pantry I once built, where I used rigid supporting poles on the upper part. See the photos in this article or look at the way I supported the upper portion of the large elliptical dome shown here. Q: I have attached a scanned copy of the house plans I want to build. The three sides would be fully bermed and the roof would be made would engineered floor trusses. The back walls would lean into the berm, but would the side wall also need to lean into the side berms? A: You could probably get by without inclining those side walls if you provided a good solid bond beam that connected all of the bag walls and also pounded the full height with rebar every couple of feet. Another way to help anchor all of the bermed walls is to insert a geotextile fabric several feet into the berm at about every third course; this is what road engineers do to stabilize many retaining walls these days. Q: I'm planning on building a small home shaped more or less like a pinto bean and recessing it into the ground. I would dig down three feet with the final floor level being two feet below grade. It's in a dry climate, 12" or so of rain a year, and I will be waterproofing with plastic on the outside, in addition to having a pumice ring around the bags up to grade level both for insulation and a capillary break. I know that round is best underground. While my house is not round, it is curved. What do you think of its ability to withstand the pressure of the surrounding earth? A: That is a fun design, and your plan seems good to me. My only concern might be with the upper part of the bean shape where it is concave, since this will not serve to naturally retain any soil pressuring against it. But since that is also where your door is indicated, you might not be planning to berm it very much, and the steps themselves will help buttress the area. Any other interior buttressing that you can build into the design on that whole wall will help strengthen it. Also, a solid bond beam at the top of the wall and periodic vertical rebar pins will help. Q: (Kelly) As far as I am concerned the idea of burying earthbag domes deeply underground is unproven and potentially dangerous. I'm pretty sure that the concept could be executed with ferrocement, at least for the upper part of the structure, but with earthbags it makes me nervous. I know that your earth sheltered multi-purpose dome has held up well, but there is not as much weight on it as there would be with a more deeply buried shelter. How do you feel about this? A: (Owen) Domes are the strongest form in nature. Forces applied to the outside of a dome go down and out since domes are in compression. I'm convinced we could apply another 10, 20, 50 truckloads of soil on top of our dome and nothing would happen. Buried dome shelters should have stabilized soil, be above grade to prevent flooding and covered with plaster and EPDM. (Kelly) I'm also convinced that domes are extremely strong inherently, and the compression of mineral material can withstand enormous pressures. But when these pressures are uneven, then lateral forces can attempt to distort the dome's form. In the cases there might be more weight bearing down on one part than another. Would this be enough to potentially deform the dome? I don't know...which is my point, we don't know because it hasn't been tried. I suspect that as long as the bag fill material is well stabilized this shouldwork just fine. The main danger is when people skimp and use loose fill, or if such fill gets too damp and mooshy. That's why I think that the safest approach is to specify an initial ferrocement form over which the bags can be stacked. It would be nice to actually experiment with heavily earth-sheltered EB domes some time to get some more empirical data. Q: I wonder about the dead load from the soil on the roof; how do you distribute the load through the bearing walls and such? A: There are many ways of supporting an earth-sheltered roof, from hefty timber framing to reinforced concrete...depending on the design. The earthbag walls are quite capable of supporting an enormous vertical load, as has been proven with compression tests...so that is not much of an issue. There should be a solid reinforced concrete bond beam at the top of the wall to help distribute the load. Q: I would like to know what is required to bury a 5m diameter dome. Do I need to reinforce with rebar, cover with black plastic and backfill in a particular way. Would it be appropriate also to fill the bags mostly with cement? A: I wish that I could give you some definitive answers to your questions, but unfortunately we have little knowledge about burying earthbag domes, because there are very few examples of people doing this. I know of several small (about 3m) domes that have been covered with earth, but not entirely buried underground. Theoretically it should work, especially if the fill material is stabilized with cement, but doing this would be experimental. Covering the dome with plastic is an excellent idea, and backfill in a uniform, symmetrical pattern, so that the forces are always evenly balanced. The ground we are working with is mostly clay. I am thinking to import sand. What ratio of sand, cement and clay do you think? Should I use clay at all? To some extent clay and cement serve the same function of binding the larger particles together, but of course clay is not stable and will become a shape-shifter if it gets wet, whereas once cement cures this won't happen. If you use cement, I suggest that you just use sand and other larger aggregate for a much stronger material. I am thinking to put rebar through each layer to connect to the layer of bags underneath. Will that work if the lower bags are already dry? Or will that compromise the bags? There is certainly no harm in using lots of rebar as you suggest, and it might help hold the whole dome as a monolithic unit, but once the concrete has cured it will difficult to pound it into the lower bags. You will also want to use two strands of barbed wire between each and every course, for the same reason. Q: We have excavated a hole into one of the banks to build a semi/ underground earthbag dome for cyclone protection. The size of the dome will be only 9'10" (3metres) in floor width and our bank cut out either side is 8'10" (2.7metres) in height. we were thinking that once built to the loft height and the waterproof lining is secured , we would be able to then carefully fill in dirt around the sides. this means that the dome would be almost completely covered up to the loft height. We were thinking we would need to also then have the sides secured with rebar. Do you have any suggestions for this type of approach? A: With such a small dome, you could probably do as you plan without ill effect, especially since it will be bermed only up to loft level. Generally you want all of the pressures equalized in every direction so that it is all balanced, so you will want to make sure that the door opening is well buttressed. I bermed up a much larger dome to about five feet on one side and it worked fine. Q: Could the inner walls could angle out a bit, if that would help the structural integrity of an underground house? A: I am building a root cellar/pantry for myself using bags filled with the native sand, and these walls are straight and do incline outward for stability. Q: Would it be possible to build a regular 20ft dome on a flat surface and then have the interior be 3ft or 4ft underground? Would it be stable and durable? A: You would be much better off digging down to the depth you want first and then building up to the ground level with earthbags. These could be vertical so that the dome starts its arc inward from that point on if you want. And, of course, all of the soil you dig out can be used to fill the bags, if that is what you are using for fill. Some types of soil might allow a bare earth ledge when dug out later, but most would not be stable enough. I'm just curious if digging down would affect the overall stability of the dome? Digging straight down and then starting the spring line of the dome at ground level will not affect the stability of the dome because the lower portion is completely buttressed. I've known of people doing this effectively. Q: How difficult is it to lay across plastic sheeting, and then bury the dome. Of course, the next issue is the difficulty in keeping the dirt over the dome...and the fear of collapse inside the dome. Wind would not make any difference..but earthquakes are a major concern. A: There have been few instances of earthbag domes being buried, and those that have are quite small. I recently tried an experiment of doing this in a desert location in New Mexico, and so far so good. The dome is 8 feet in diameter, the fill is perfect adobe soil that was dampened and tamped in place. I used no barbed wire, as I felt the fact that it would be buried would keep it from expanding outward (but this is in a non-seismic zone). I lined the dome with plastic before covering it completely with soil. And then I put stones over the top of the dome to keep the wind and rain from washing the dirt away. Q: I am a senior in high school looking to build an earthbag shelter before I go to college. I have a very small budget and I finally found two pieces of land in Orange County, New York, that would not be too expensive; they are about the same price, and I was wondering if you could weigh in on which one would be better to build an earthbag home on. One is 1.1 acres, but in a span of 200 feet, rises 100 ft. Aside from that, it is perfect. The second property is .4 acres, and it is pretty flat. Aside from the size, it is perfect. I am not sure if the slope of the first property would be problematic, because if not it would be perfect also to provide privacy and ample land for my homesteading fantasies. However, safety is always my top concern, and if an earthbag house was built on that kind of slope is dangerous, I would only consider the second property. A: Hillsides often offer advantages in terms of being able to dig into the side of the hill and have both a a walkout entrance and a naturally bermed or underground shelter. This advantage is enhanced if the hill happens to slope downward toward the south, so that you can take advantage of the sun exposure for passive solar heat. But with that said, property that rises one foot for every two feet of lateral distance is rather steep, but not impossible. Suppose that you wanted to build a shelter that was 16 feet on the side that was dug into the hillside, then the back of that would be 8 feet deep, which is about right for the height of a standard room. Also, with an earthbag shelter, you can likely use the soil that is excavated to fill the bags, so that might be another advantage. So, I would say that if you are lucky enough to find property that slants to the south (or generally in that direction by say 15 degrees in either direction) then this might be a good choice. The year-round temperature underground in New York is in the low 50's, so you would only need to increase that by about 20 degrees to be comfortable, and this could be done with the passive solar. Q: I'm trying to adapt earthbag building and potentially hempcrete building to create a permanent and spacious "hobbit home". I had intended to cut into a SSW facing hillside, construct the home, and then virtually bury it with the obvious exception of the windows and any dome type skylights. Does this seem possible? A: Earthbag side walls can withstand a great deal of weight bearing on them, but you will need a well engineered support system to completely bury the house, and earthbags alone can handle this only on a small scale with a circular dome perhaps. Q: I'm looking to build an underground, or bermed I guess, domed earthbag home. I live in NY and we get all the seasons, decent rain and definitely humidity. I was wondering if I didn't want to use 6mil poly to waterproof, as I don't to want affect the breathability of my home, would using a double thickness of earthbag work? So basically like an outside wall and then an inside wall stacked against each other? Or would water breach both layers? A: First of all, I might caution you about your idea of building an underground earthbag dome. The only such structures that have been successfully built that I am aware of are quite small, on the order of perhaps 10 feet in diameter. Larger ones might work, but you would be doing this on experimental ground, and failure could be deadly. As for maintaining breathability of a bermed or underground wall, this can really only be done with the interior surface; the exterior will never breath much, whether it is covered with a moisture barrier or not. So you are much better off using the moisture barrier to keep all moisture out of the wall, as this will be better both thermally and structurally. I really don't see any advantage of creating a double wall system, unless you wanted to fill the outer bags with an insulating material and then the interior portion with earth. A system like this could have some real thermal advantages, as the insulating shell would protect the inner thermal mass, which would stabilize in the interior temperature. In the area where you intend to build some degree of insulation from the bermed soil would be beneficial.